Wal-Mart disclosed its Black Friday deals -- which actually will be available beginning at 8 p.m. on Thanksgiving. Wal-Mart wants you to forget Black Friday this year. Instead, the store is kicking off some of its hottest "Black Friday" deals on Thursday, Thanksgiving Day, beginning at 8 p.m. The retailer says its best deals will be on electronics, tablets, TVs, gaming consoles, home appliances and toys. Last year, Wal-Mart rolled out its Black Friday deals at 10 p.m. on Thanksgiving Day. This year is the earliest that Wal-Mart (WMT), the world's largest retailer, has ever jumpstarted its holiday sales bonanza. Duncan MacNaughton, Wal-Mart's chief merchandising officer, said the decision was based on customer feedback. "Our customers told us they wanted to shop earlier this year, and go to bed earlier," he said. MacNaughton also promised that Wal-Mart's Black Friday deals will be "some of the most aggressive" the retailer has ever had. Wal-Mart is rolling out the discounts in three stages. Phase 1: Beginning at 8 p.m. on Thanksgiving, the best in-store deals are on toys, games, home goods and clothing. These include Xbox 360 4GB with SkyLanders bundle for $149; Nintendo's Wii console for $89; a Crock Pot 6-quart slow cooker and Mr. Coffee programmable 12-cup coffee maker for $9.44 each; DVD and Blu-ray movies for $1.96 to $9.96 each; video games for $10 to $25 each; Barbie, Bratz and Disney Princess dolls for $5 each. Phase 2: At 10 p.m. on Thanksgiving Day, the deals mostly focus on electronics. Among them, Samsung 43-inch, 720p plasma HDTV for $378; HP 15.6 -inch laptop with 4GB and 320GB hard drive for $279; Beats by Dr. Dre headphones for $179.95 and Samsung Smart ST195 digital camera for $99. 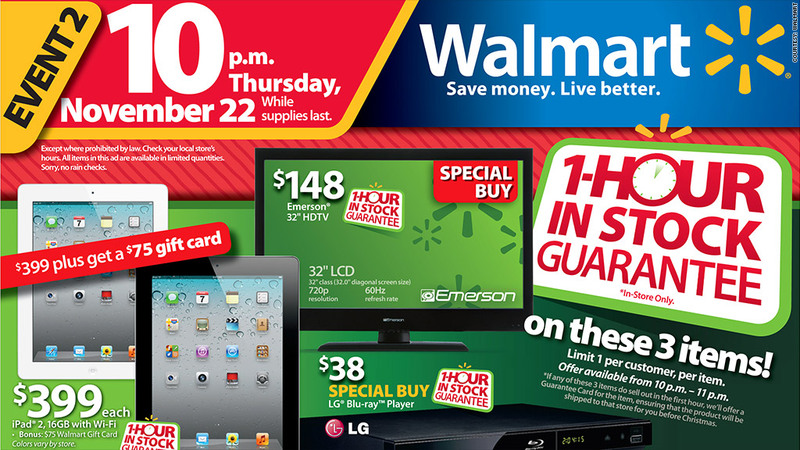 Between 10 p.m. and 11 p.m., Wal-Mart is also guaranteeing that customers who are already waiting in line inside the store will be able to buy three special deals -- Apple iPad2 16GB with Wi-Fi for $399 plus get a $75 Walmart gift card; Emerson®32" 720p LCD TV for $148 and LG Blu-ray Player for $38. MacNaughton said the Wal-Mart is offering that guarantee because it has enough inventory of those three products to meet the anticipated demand. Phase 3: On Black Friday, Wal-Mart's deals, which roll out at 5 a.m., mostly focus on home goods, jewelry, tires and furniture. Wal-Mart is also offering separate Thanksgiving Day and Black Friday deals on electronics, TVs and toys that will only be available online.